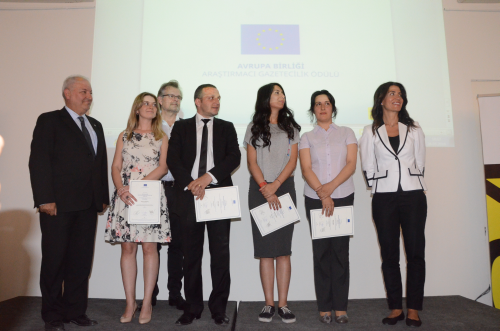 The second EU Investigative Journalism Awards, organized for and administered by Punto24 (P24) were presented to the recipients on May 26 in an award ceremony in İstanbul. The jury, chaired by Professor Arzu Kihtir of Isyanbul University, and composed of journalists Hasan Cemal, Tuğrul Eryılmaz, Cengiz Çandar and press attorney Fikret İlkiz, awarded Hilal Köse the first prize with her news story entitled "Such an Atrocity Has Never Been Seen" of Cumhuriyet newspaper. Second prize went to Arda Akın of Hürriyet newspaper for the series “89 Times Maşallah” documenting false customs declarations by the Turkish-Iranian businessman Reza Zarrab who is currently under indictment by a US court for corruption. The jury split the Young Journalist Award between two journalists whose stories received equal points in the final evaluation. One of those journalists is Burcu Karakaş with her story about suspicious deaths of women in the South East province of Van, published by daily Milliyet, and the other is Canan Coşkun for her story about top officials’ misuse of power, published by Cumhuriyet. Swedish Counsel General Jens Olander handed out the certificates to the winners at the ceremony. Other counsel generals present at the award ceremony were Federica Ferrari Bravo from Italy, Adriana Ciamb from Romania, Henri Vantieghem from Belgium and Pablo Benavides Organ from Spain. Representatives of the British Embassy and İstanbul consulate; Dutch consulate and others from the Swedish Consulate were also present, together with overall 80 attendees, including journalists, writers, representatives of media organizations and academics, at the ceremony held at the Cezayir Restaurant in Taksim, in the heart of Istanbul. The Turkish jury head, Kihtir, said that many successful examples of good journalism were among the news stories submitted for the award. “The award jury based its decision by evaluating the news stories in regards to chronic wounds in the Turkish society, such as, child abuse in imprisonment, femicides, and misuse of power,” she said. ''As in any of our member states, Turkey needs professional investigative journalism, and you are making an important contribution to it'', wrote Ambassador Hansjörg Haber, head of the EU Delegation in Ankara in a message of congratulations to the winners. There were 12 women applicants this year from among the 31 journalists who submitted a total of 43 eligible news stories. The contest sought to reward the best investigative stories of 2015. First prize amounts to 4000 Euros, second prize 3000 Euros, and finally1500 Euros for each winner in the best young investigative journalist category. 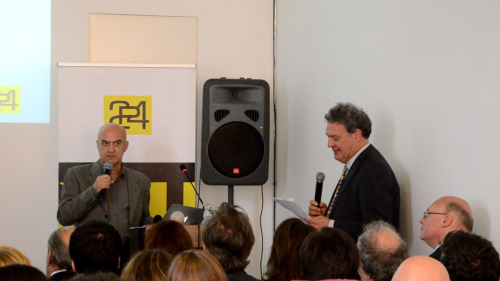 Yavuz Baydar, a founding member of P24 and National Coordinator of the Awards, said the award recognizes a strong need to support freedom of expression and investigative journalism at a time when journalism is under great pressure in Turkey. “We need investigative, truthful, bold journalism more than ever to confront even elected leaders who resort to censorship and other methods of restricting freedom of expression. Hopes and trust in democracy can flourish only in countries where investigative journalism is kept alive,” he said. Journalist and writer Hasan Cemal, founding president of P24, addressed the participants saying that Turkish media has been going through a test, “We are lucky to have journalists to give out investigative journalism awards in such a period.” He reminded that Coşkun, who just received an award, appeared at a court that very day for her news story about favorable home sales to judges, for which she faces 23 years of imprisonment. “We cannot talk about an independent media where judiciary independence and separation of powers do not exist” Cemal added. First award winner Köse also said that journalism day by day has become a more difficult profession in Turkey. “The Kurdish press cohort face imprisonment and the national press face unemployment. We have many reasons to feel hopeless and helpless. It’s been pleasing for me, and I am sure for my colleagues, to have received an award for a news story in such a period”, she said. Akın, the runner-up, said he faced smear campaigns by journalists from the pro-government media after his front page account of Iranian sanction busting and money laundering appeared. “I was threatened by some columnists and I face court cases. There is an investigation going on against the inspector who investigated the deals of Zarrab. In the process, we have seen the truthfulness of our reports as Reza Zarrab was arrested in the US. I extend my gratitude to the jury, P24 and the European Union for the award”, he said. Karakaş, one of those selected in the young investigative journalist category, said that her story prompted the Ministry of Family and Social Policies to collaborate with women’s organizations and universities in Van to research women suicides. “Good journalism is something to be proud of. We shall endeavor to produce good journalism,” she said. The EU award for investigative journalism in Western Balkans and Turkey was established by the European Commission following the EU Enlargement strategy to monitor the reform processes and to keep the historical momentum towards the EU accession. The prize is also awarded in six cuntries of the SEE region. It follows strict criteria and procedures set out in a mutually agreed handbook.